VATICAN CITY (CNS) — Assuring his prayers for the victims and families of the terrorist attack in Brussels, Pope Francis condemned the “cruel abominations” and prayed for the conversion of those who adhere to violent fundamentalism. “To all, I ask that you persevere in prayer and in asking the Lord in this Holy Week to comfort the hearts of the afflicted and to convert the hearts of those people taken in by cruel fundamentalism,” the pope said at the end of his weekly general audience in St. Peter’s Square March 23. “I renew an appeal to all people of good will to unite in the unanimous condemnation of these cruel abominations that have caused only death, terror and horror,” he said. Three nearly simultaneous attacks — two at the Brussels airport and one on the Brussels area of Maalbeek, near where much of the European Union is based — left at least 34 dead and more than 200 people injured. The Islamic State group claimed responsibility for the attacks. Soon after the attacks, Cardinal Pietro Parolin, Vatican secretary of state, sent the pope’s condolences to Archbishop Jozef De Kesel of Mechelen-Brussels. “The Holy Father again condemns the blind violence which causes so much suffering, and he implores from God the gift of peace,” the message said. Jesuit Father Federico Lombardi, Vatican spokesman, told reporters the attacks in Brussels would not lead to any changes in Pope Francis’ Holy Week and Easter schedule. Already for the Year of Mercy, especially after the November terrorist attacks in Paris, the Italian police presence at the Vatican has been increased. After the attacks, Belgium raised its terror alert to the highest level. “We must support the efforts of the public authorities we’ve elected and mandated to serve the common good and maintain law and order — it’s not for us to start polemicizing and making accusations today as to whether they fulfilled their duties and did all they could,” Bishop Kockerols said. 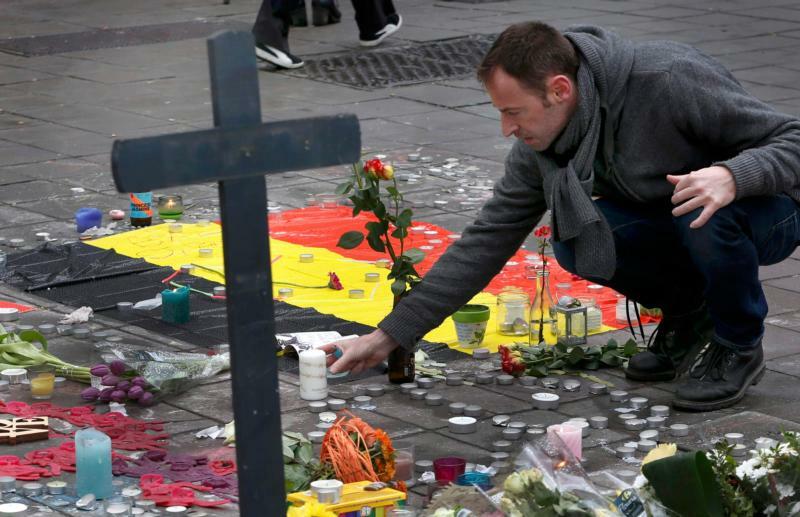 Cathobel issued an emergency number for those seeking information about missing family members and said it had been in contact with Father Michel Gaillard, the Brussels airport chief chaplain. Meanwhile, German Cardinal Reinhard Marx, who heads the Brussels-based Commission of the Bishops’ Conferences of the European Community, or COMECE, said Catholics would be “praying especially in Holy Week” for victims of the violence. In a statement, he said he had been concerned about COMECE staffers, who later issued a message confirming that all personnel were safe. A bishops’ conference staffer, Father Geert Lesage, told Catholic News Service he expected Catholic clergy to visit sites of the attacks to offer pastoral care, as well as to organize special Masses as soon as security conditions permitted. However, he added that all mobile phone connections were now down in Brussels, making it impossible to obtain news of Catholic victims or damage to church property. Father Charles De Clercq, a Brussels priest, told Cathobel he had been in the first car of the bombed Metro train, which had been “plunged into darkness and filled with smoke” after the explosion. “Smashed windows fell on my knees — there was light, smoke and shouts. The driver arrived after two minutes with a lamp and made the passengers leave via an emergency window,” the priest said. A day earlier, gunmen in Bamako, Mali, targeted a hotel that was serving as the headquarters of an EU troops who were there to train the country’s military. Mali and other West African countries have been under attack by Islamic extremists. Catholic Relief Services, which has programs in Mali, announced March 22 that its staffers were safe after the attack. Contributing to this story was Jonathan Luxmoore in Oxford, England, and Cindy Wooden at the Vatican.